(CNN) -- For Mary Crowley, the sea is her second home. She learned how to sail at age 4 and spent almost half her life running an international yacht chartering business in Sausalito, California. But about two years ago, Crowley dove into a new project: helping to clean up the world's oceans. She set sail on a monthlong voyage into the North Pacific Gyre, parts of which are known as the Great Pacific Garbage Patch. The gyre, or area of spiraling ocean currents, is approximately twice the size of the continental United States. 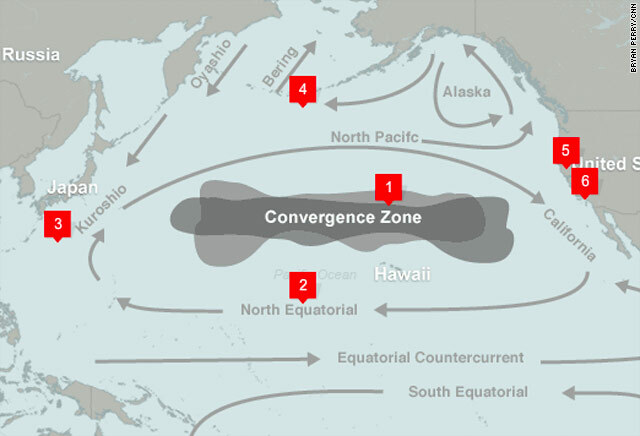 It isn't filled with garbage, but the region is known for accumulating large amounts of waste and debris that get trapped by its large clockwise currents between North America and Japan. "I've been out to the same part of the ocean 30 years ago, and then, it was clean oceanic wilderness. And now, it's like a dump," Crowley said. "This is significantly worse." In August, Crowley began traveling aboard the Kaisei sailing ship with a crew of 25 people, including several scientists and other ocean enthusiasts, to better understand this relatively unknown area. "When you're first out there, you see this beautiful, beautiful deep blue ocean," Crowley said. "And then you look closer, and you see that there's this proliferation of floating garbage. And depending on what part of the ocean one's in, you can stand on the bow of the boat and count 400 pieces of garbage. Or in some places, you might only find 25 to 50 pieces." This expedition was planned and funded through Project Kaisei, a nonprofit organization that Crowley co-founded in 2008, along with partners George Orbelian and Doug Woodring, who share her love for the sea. Woodring, who is based in Hong Kong, also spent time on the water this summer. He was Project Kaisei's team leader on the New Horizon, a research ship operated by the Scripps Institution of Oceanography at the University of California, San Diego. Scripps collaborated with Project Kaisei on a three-week voyage, where one week was spent conducting scientific studies in the gyre. Together, the New Horizon and the Kaisei covered about 35,000 miles in that region. While the team found many big pieces of plastic and other trash, Woodring said they were really shocked by "the density and the pervasiveness and extent" of small plastic particles they found. Both ships started sampling the water to collect organic life about 400 miles off the coast of California. Out of more than a hundred samples, not a single net returned without little plastic particles. "Because they [the bits of plastic] are so small, it's hard to find water without it," Crowley said. Scientists say that much of this debris comes from land, rather than from ships. Litter from up to hundreds of miles inland can come from places like cars or storm drains and end up in the ocean. "Estimates are that 50 to 80 percent of what ends up in the ocean starts on land," said Dianne Sherman, director of the International Coastal Cleanup at the nonprofit Ocean Conservancy. Last year, the organization collected more than 7 million pounds of trash on or around the coastline, including 250,000 pounds of debris found in the ocean. Sherman said that while an increasing number of dead animals are found with plastic in their stomachs, the scientific community has not reached a consensus on the effect the plastic has on the food chain and on humans. Crowley is hoping that Project Kaisei's studies can help further determine these effects. It was clean oceanic wilderness ... now it's like a dump. "The pieces of plastic that get broken down get ingested by sea birds, marine animals and fish," she said. "If they get eaten by little fish, the little fish get eaten by bigger fish, and then these plastics, that act as sponges absorbing toxins, end up in our food web." One of Project Kaisei's goals is to test new technologies that will help clean, recycle and reprocess debris into other materials. The team didn't waste any time attempting to achieve that. On Kaisei's 30-day voyage, Crowley's colleague, Norton Smith, and his niece, Melanie, developed a prototype to help collect the plastic in the water. Nicknamed the "Beach," the device used wave energy to lap up water on a beach. Crowley said it was successful in doing exactly what a beach does: collecting plastic garbage, but not sea life. "It was a challenge to build these devices aboard ship, but very rewarding to see the results," Smith wrote on Project Kaisei's blog, which detailed the entire trip. Crowley envisions a future with multiple expeditions a year that sail for longer periods of time. "The goal would be to do more science," she said. "We would go out there with large commercial fishing vessels ... that could bring back many tons of garbage. And then we would work with our recycling partners and we'd recycle this material." There's even discussion of having a recycling plant built on a ship, for the sake of efficiency. "It could be out stationed in the gyre six months of the year and collecting garbage," Crowley added. "You sort of need calm conditions to do effective garbage collection. But you could move to the South Pacific Gyre for the other six months." "It's almost like a space race. There's a whole lot of opportunities for new players to get involved," Woodring said. Opportunities that include turning plastic into fuel. "It's something we intend to do this coming year," Crowley said. "We're also looking at turning plastics into building materials. Our experts tell us they think it will work extremely well with the plastics in the ocean." And while many think cleaning up the gyre is an unfeasible task, Crowley remains fully committed. "I do feel it is a formidable project," she said with a laugh. "And we do need a lot of support and assistance. Many countries and companies and cities have contributed to this problem, and we need to all work on solving it together."